Devil May Cry 5, Resident Evil 2, and more. 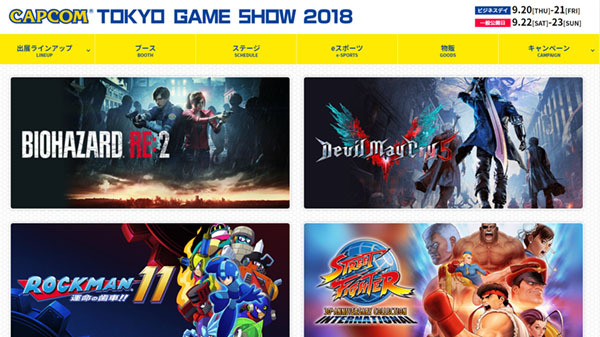 Capcom has opened its Tokyo Game Show 2018 website and announced its lineup of exhibiting titles, as well as a Monster Hunter: World tournament that will take place at the event. Playable on both PlayStation 4 and Xbox One, and with Japanese voice-overs. Playable on both PlayStation 4 and Switch, with four stage choices and three difficulty options. Attendees can choose to play as Leon Kennedy or Claire Redfield. All 12 titles within the collection are playable. On September 23, on the main stage at the Capcom booth, Capcom will host the Monster Hunter: World Dream Match at Tokyo Game Show 2018, where the five hunter teams who have won the Monster Hunter: World tournaments held in the Japan, Korea, America, Taiwan, and Hong Kong regions will gather and challenge two new “Dream Match” quests. A winner will be decided based on each team’s clear times of the two quests. Various other stage events are also planned. Please look forward to the full schedule at a later date. Update 09/14/18 at 5:00 a.m.: Added Capcom Beat ‘Em Up Bundle and Toraware no Palm: Refrain to the lineup.